2001 John Deere 648GIII Dual Arch Grapple Skidder. 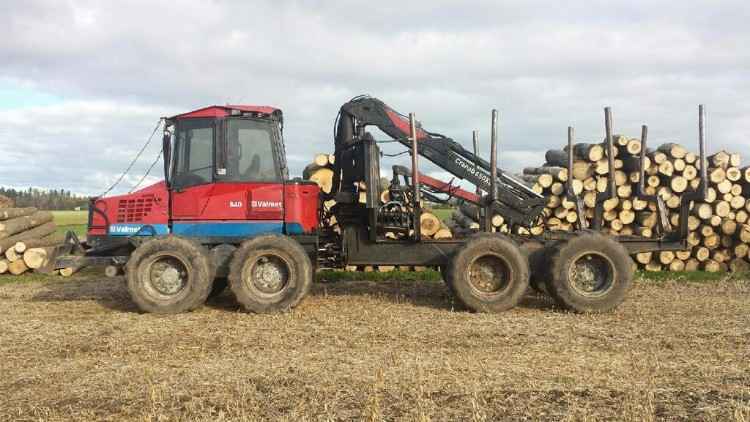 This skidder has 4,000 hours on a rebuilt 6068 engine, runs and starts good. Direct Drive transmission, strong hydraulics and cylinders. Dual Arch. 30.5x32 tires. Heat, A/C, and lights. Clean, well maintained, and on a regular service schedule. Contact Erik @ Red Pine Equipment 218-720-0933. Machine is located in Northcentral USA. Good machine that has been maintained and is ready for work. Includes 3/4 cord clam. Machine is located in Thunder Bay, Ontario, Canada. Contact Patrick at 807-621-1158. 2001 Valmet 911 Processor with a 965 Dangle Head. This machine has a 5.9 Cummins engine, runs and starts good, 18,000 hours, newer valve cover gaskets, new batteries, new slew gear on cab, strong hydraulics and cylinders, new link where head connects. New computer screen, head will need some rewiring. Tight boom, bogies are in good order, tires are @ 40%. Heat, A/C needs a charge. Contact Erik @ Red Pine Equipment 218-720-0933. Machine is located in Northeast USA. 2001 Hydro Ax 511EX Feller Buncher. This cutter has a 6068 John Deere engine, runs and starts good, newer re-man engine, strong hydraulics and transmission, cylinders are in good working order, tight center section and lift arms, 20" Waratah head, straight disc, newer teeth could be turned. Newer Lexan glass, 28Lx26 tires 50%. Heat a/c and lights. Contact Erik @ Red Pine Equipment 218-720-0933. Machine is located in Northcentral USA. 2001 Fabtek 546C 6 Wheel Double Bunk Forwarder. This equipment had an overhauled engine 500 hours ago, runs and starts good, pre-heat system, newer computer, strong hydraulics and cylinders, transmission in good order, cradles and axles are in good condition, tight boom and grapple, heat, A/C, and lights. Contact Aaron @ Red Pine Equipment 218-720-0933. Machine is located in Northcentral USA. 2001 Ponsse Caribou 8 Wheeled Double Bunk Forwarder. This machine has a 4cyl Mercedes engine, runs and starts good, 16,000 hours, strong hydraulics, new traction pump and transfer case, bogies in good working order, new joystick controls, tight boom and grapple, heat, A/C, lights, new tracks, and chains. Contact Aaron @ Red Pine Equipment 218-720-0933. Machine is located in Northcentral USA.